Obtaining quality academic regalia shouldn't be a struggle. Caps and Gowns Direct makes ordering your academic apparel - graduation regalia easy with our outstanding customer service, and IN STOCK and custom made cap and gowns, doctoral tams, and academic hoods. 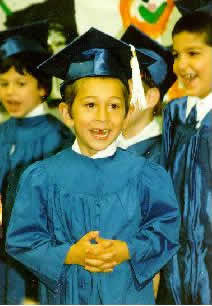 We keep a full range of student cap and gown sets in stock for high school and kindergarten, bachelors, masters and doctors for quick delivery. 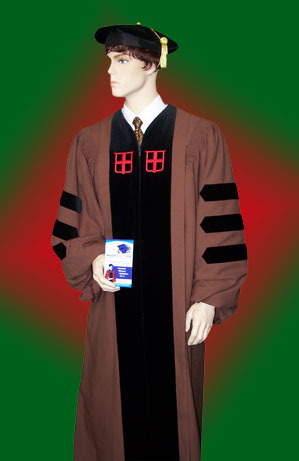 In addition to student graduation gowns, we also stock a longer lasting faculty quality master's gown and doctoral robe, and also make deluxe and custom academic regalia, such as the custom doctoral gowns shown on this page, and on our doctoral gown pages. 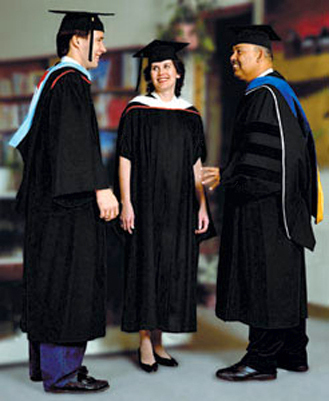 Caps and Gowns Direct offers both traditional academic regalia and specialized doctoral regalia. 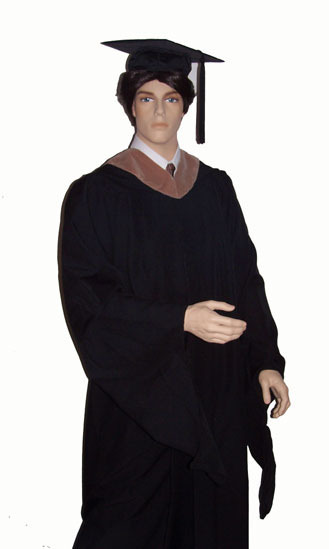 We also carry a full line of student and faculty quality academic robes, caps and tassels, including doctoral caps and gowns, tam and graduation hoods (doctoral hood, master's hood, etc.) in stock to service your last minute emergencies as well as custom graduation wear orders. Additional information about the different types of graduation regalia we offer can be obtained by clicking on its link, or you can contact our office directly. Faculty members: Miss the ordering date in your local bookstore, but still want a quality doctoral gown? 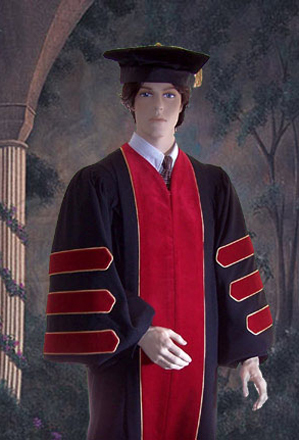 We keep deluxe Ph.D. gowns IN STOCK, as well as velvet tams and graduation hoods, and we accept late orders. Our cap and gown department is reachable by phone (412-422-GOWN), Fax (412-421-2145) and e-mail for all your graduation regalia requirements. Academic Tassels and graduation gifts. Doctoral caps / tams in four - six - or eight sided models. Bachelors, masters and doctoral level academic attire. 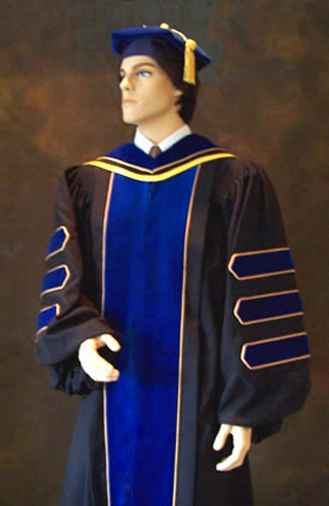 PhD Gown and academic hood with gold piping. PhD tam in matching blue velvet with gold bullion tassel. Master's gown, with MBA graduation hood, mortarboard and tassel.